Skirted top, A boutique in Hong Kong; Leggings, H&M; Crochet kimono cardigan, Topshop; Boots, ASOS. Hello strangers! I feel completely out of it recently… it doesn’t even feel like a Friday to me, can someone wake me up from this terrible dream?! I wore this on Sunday for a day of magazine design, seeing my Granny and going for sporadic drives. Last week, my godmother, who lives all the way over in Hong Kong, sent me a little care package as a graduation present. Inside lived this lovely skirted top, along with a few other pieces that I’m excited to wear: I just need to find space in my room and wardrobe to store everything! 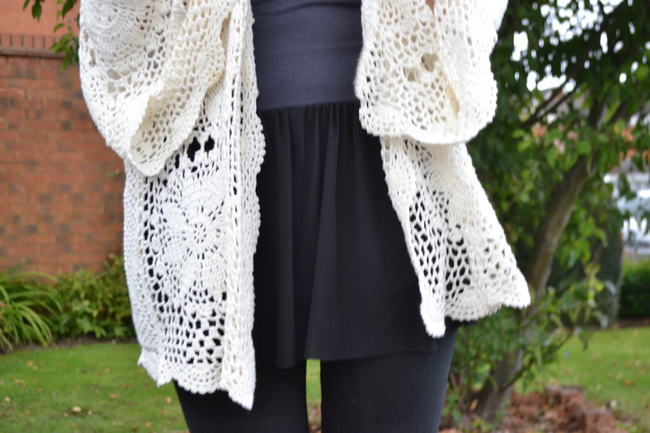 I teamed it with my favourite cosy leggings and that crochet kimono that everyone seems to love or hate. Dressed up with my ASOS boots that are surprisingly easy to drive in, and then I added colour with my favourite statement necklace – a piece that I bought when I worked at an independent jewellery boutique, years ago. By the way, my Aggie boots from ASOS are still available online, despite this particular pair being over a year old now, I believe they no longer sell these in black, but the other colours are still gorgeous. Don’t forget to vote for Daisybutter to win a Cosmopolitan Blog Award for the Established Fashion Blog award! It would mean the world to me.